I started in the hobby as a youngster and for reasons not really understood I still raise pigeons. 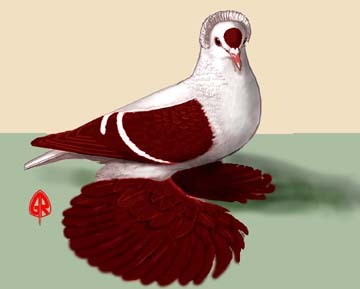 Among my first "purebred" pigeons was a pair of Ice Pigeons that I purchased from Norman High in the early 1960's. In 1957 Norman was the first person in the history of the NPA to be presented our organization's Master Breeder Award in Ice Pigeons. I learned a lot about our hobby from Norman and through him I was able to meet other "older and wiser" fanciers who became my mentors. In the mid 1970's having finished with my enlistment in the Navy I was reintroduced to Ice Pigeons by Ellsworth Kistler. Thanks to imports and selective breeding the quality of the Muffed Ice that I purchased from Ellsworth and a few other fanciers I once again took up the challenge of breeding quality Ice. A few years later I added 3 imported Clean Leg Ice, (one barless, two white barred) to my loft. By using my muffed Ice I was producing Clean Legs that were equal to or even better than my Muffed birds. At the NPA 1991 Milwaukee Grand National I was presented with my Master Breeder Award for Ice Pigeons. This was a great honor because I became the second recipient for this award in the breed. A few years ago I sold all of my Ice and became a fancier of Swallows and Saxon Field Pigeons. (Please respect the artist's rights. The drawings of the Saxon Field Pigeon and the drawing of the Swallow are Copyrighted by Gary Romig, Jerome AZ. Permission Must be granted before downloading.) Besides Exhibiting pigeons I do some Judging as well. Although my main interest is raising and exhibiting Pigeons, I enjoy researching the history af Rare Breeds. Over the years I've written articles that have appeared in the American Pigeon Journal, the Pigeon Fancier, the Pigeon Debut and Bird Talk. Vietnam Veteran Although I was a Hospital Corpsman in the Navy I served in Vietnam as a Combat Corpsman with Golf Company Second Battalon Twenty Sixth Marines in Vietnam in 1969 and 1970 . My tour was in the "field" and I lived like any Marine who was a member of our rifle company. Since my return home I've participated in Fund Raising walks in order to raise money for the Vietnam Memorial in Washington D.C. (the Wall), the Maryland Vietnam Memorial and the Carrol County Vietnam Veterans Memorial. TO MY FELLOW NAM VETS "WELCOME HOME"